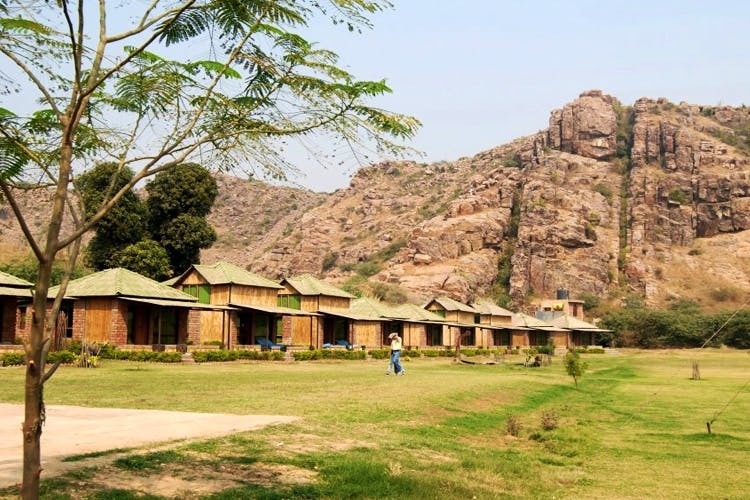 Overlooking the rocky Aravalli Hills, Camp Wild is an eco-forest in Mangar Village (Dhauj) that’s perfect for a day of picnicking, zorbing, rock-climbing, bird watching or kicking up a storm on the mountain bikes. The closest place with mountains, meadows or starry skies might be at least 4-5 hours from Delhi. And truth be told, this has always dissuaded us from getting up on whim and taking off for an outdoor trip. Enter Camp Wild, and all this changes for the better. Whether you’re going for rock-climbing (in the world's oldest mountain range that is Aravali Hills), or to learn to make a sturdy raft, you have the option of staying for a day picnic or making this an overnight scene on a weekend. Either way, there are loads of activities for adventure junkies and nature lovers alike. Think rappelling, cycling, sunset hikes, a fully-loaded obstacle park and more. We’re so glad that this trip can be customised to a great extent, where you pay only for activities you choose and the cost keeps going down as the group size gets bigger. But if you’re going with your gang and want a holiday of sorts, you can stay at their eco-lodges and glamping tents starting at INR 2399 (1N/2D). Take our word for it; the lodging is cosy and beautiful. You can check out their website for all the information about the packages, prices and inclusions. This place is perfect for when you want to spend some quality time with your fam. Plus, it helps that Camp Wild near Aravalli Hills is situated less than two hours away.